There’s not always much attention paid by outside observers to ideological debates in China. But there should be, because as much as Marxism or socialism doesn't seem to play a role in people’s daily lives, political arguments about ideological direction in Beijing are genuine. And how these arguments end up above will help determine how cities, counties and townships are guided below. Talk to any Communist party member –especially a cadre charged with governance of some sort--and they’ll tell you that slogans are strategies. Slogans and sayings provide markers and reminders about what political superiors want to see implemented, and they’re designed to provide a platform, a context, and a referent for practical solutions—something that officials at all levels want more of, in part because their betters and their constituents insist on it. Right now, the lead ideological slogan is 两学一做 –or, roughly translated, “two studies, one effort”. And there’s a strategy lurking in this catchphrase. The “ two studies” part involves political discipline and ideological instruction, so that party spirit and morality are enhanced, and that cadres buy into what Beijing’s been selling. It’s not been easy to get party members to have faith in yet another series of statements and slogans, especially as many have been more concerned about Beijing’s anticorruption campaign than a new vision for a new China. So this effort is to broaden the party’s educational scheme to start to move away from slapping cadres about to focusing on getting them to sing from the same general hymnal. The “one effort” component of the slogan references unity but also practical considerations: Cadres are to learn from each other and their errors, so that they can reconnect with the masses by solving local matters and be seen as doing real work for real people, instead of focusing on themselves and their career prospects. Announcements, admonitions and instructions are all well-intentioned, but implementation is always the biggest challenge for Beijing. It’s not that lower-level officials are necessarily disposed to reject what the central leadership prescribes because of local conditions; it’s that they’ve been receiving different signals from different places about whether its economic growth or ideological campaigns they should be giving priority to. This slogan is meant to end that static, and get everybody on the same course. This effort to mobilize retired rank-and-file seems to be all the local rage in at least some parts of the province, and it makes practical sense where solving problems are concerned. Older cadres often return to their ancestral village or hometown after they retire, and residents there usually see them as trusted and venerated members of the community. But there’s politics at work here as well. First, there’s Xi’s purported campaign against the Communist Youth League. It makes sense to rouse retired cadres for support if younger colleagues and their patrons are under suspicion for malfeasance or just inattention to important party matters. Then there’s the risk of mobilizing younger party cadres on the 50th anniversary of China’s Cultural Revolution; by doing so, you may spark a political movement that won’t be yours to control. Xi’s opponents could use such a development to hit out at his leadership, or even look to leverage local dissatisfaction with some of his policies to resist his efforts at changing the way the Party operates. Using the old to stiff-arm the young instead makes good political sense here too. Finally, there’s the very real probability that this idea to employ retired Party rank-and-file didn’t come from the top, but from below—from the retirees themselves. 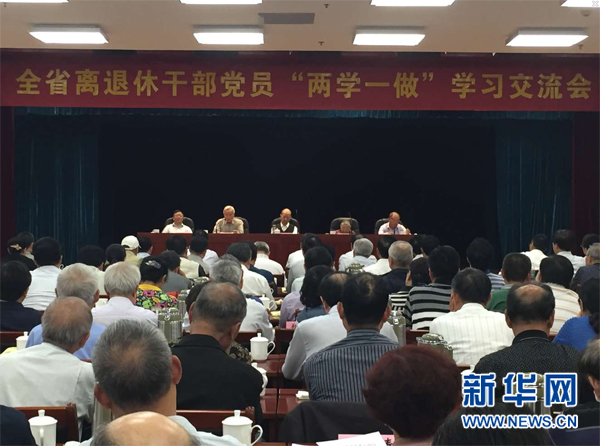 In Jiangsu, there are more than a few cadres who think that the Communist party has lost its way in recent years, focusing on the economy at the expense of ideology. They think Xi is largely right in what he wants to do: Party reform, not political reform. Conservatism, socialist core values, greater intervention by the Party to protect the indigent and the aged—these are all goals that appeal to officials who return to their birthplace and see a patina of progress without actual improvement to the circumstances of many. These retired cadres aren’t interested in stepping back but stepping back in. They believe ideology matters, and they think they could matter as well. Xi could use their help, and so can a lot of localities in Jiangsu.